Maremmana breeders were exported from these areas to various regions and countries. The Grand Dukes of Tuscany sent breeders from their holdings to Hungary to reinvigorate the Pustza breed. With the progressive reclamation of the marshlands, the breed underwent notable impetus between the First and Second World Wars; thanks to intensive selection work. After World War II a period marked by agricultural mechanization and farming reform, the breed decreased greatly in number. Added to this was the negative impact of replacement crossbreeding, which further decreased the number of bead as far as purity is concerned. Despite these events, the situation has been changing over the past few years. The Maremmana breed is reasserting its perfect suitability to the habitat that shaped it, populating areas that bad previously been off-limits. The breed is currently spread throughout the provinces of Grosseto, Viterbo, Rome, Terni, Latina, Pisa, Leghorn and Arezzo. The interest aroused by this breed has become even more intense lately; not only among certain breeders in southern Italy, but also among foreign breeders, particularly in Spain and Central America, who find that the Maremmana is the ideal means to make the most of particularly harsh environments. The National Association of Italian Beef-Cattle Breeders (ANABIC - www.anabic.it) was established to promote and implement all types of initiatives aimed towards improving, developing, and spreading the autochthonous Italian cattle breeds: Marchigiana, Chianina, Romagnola, Maremmana and Podolica. 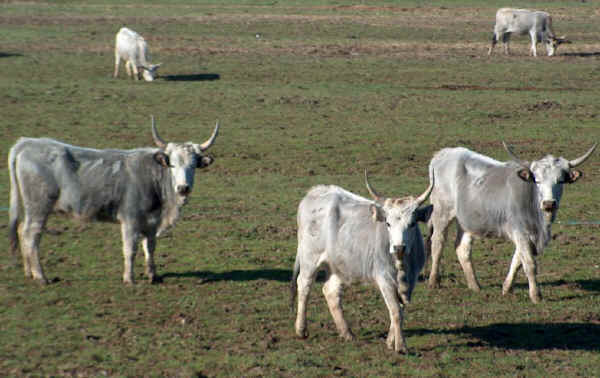 ANABIC, which came about by merging the prevously existing individual National Breed Associations, has taken on their responsibilities as far as selection is concerned and has set up a single National Herd Book for the Italian beef-cattle breeds. The Maremmana has an impressive skeletal structure that gives the adult a very solid and robust appearance. These very large sized cattle have extremely solid legs, exceptionally hard hooves and, in general, perfect perpendicularity. These very rustic cattle characterized by solidity, skeletal strength and good muscle tone.